Get Outdoors. Get To the Refuge. Ongoing 10am-3pm FREE Animal Olympics Games at Bailey Tract, self-guided, Tarpon Bay Rd. 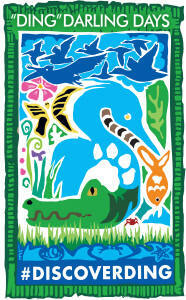 7:30am-6:30pm FREE admission to Wildlife Drive; look for Plein-Air Artists.